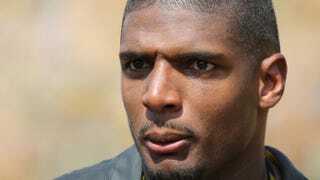 Is Michael Sam More Gay-Rights Celebrity Than Pro Football Player? Michael Sam remains unsigned by any pro football team since being cut by the St. Louis Rams. As soon as it was reported that Jesus’ purported favorite fallen quarterback, Tim Tebow, had signed with the Philadelphia Eagles, I knew someone would bring up Michael Sam and the notion of unfairness. Enter the Outsports headline: “Tim Tebow signs with the Eagles and America asks, ‘How in the $%@& is Michael Sam not with a team?’” There is a bit of irony in the criticism that Sam would be too much of a “distraction” in a league filled with them, but maybe, just maybe, Sam is also very much at fault for his very brief stint in professional football. Though it’s admirable that Sam elected to be the face of gay football players, it’s fair to argue that he may have coveted the spotlight a wee bit too much and his manner of attaining it served him no purposes—especially when his skills on the field had yet to position him as a must-have player. Like many, I was happy to read about someone black and a college football star saying that he is gay in such an important space like the New York Times. But then there was the follow-up piece in the paper that detailed Sam’s life more vividly, notably his somewhat strained relationship with his father, Michael Sam Sr., over his sexuality. After that, word of an announced and subsequently postponed OWN “docuseries” (read: classier title for reality show) chronicling Sam’s quest to be the first openly gay NFL player. I appreciated Sam’s candor at the time. I remain grateful for his attempt to help refute the perception that to love another man automatically makes one effeminate and therefore unable to excel in a sport like football (which he did as a collegiate player). In hindsight, Sam’s rollout was more fitting for the release of an R&B album than the start of a career in the NFL. Then again, all Frank Ocean did with respect to acknowledging that he, at one point in his life, loved a man was publish a couple of paragraphs about the experience on Tumblr. Ocean then proceeded to let the music speak for itself. Will Tim Tebow be as terrible as most considered him before he exited the league? That is probable, but one thing is for certain: Much of his headline-generating antics of the past have died down over time. By comparison, Michael Sam signed on for a season of Dancing With the Stars. I get it; the rent is high and if your footwork can’t cover it for the Dallas Cowboys or St. Louis Rams, then you might as well collect a check from ABC in the meantime. Nonetheless, that’s a show all too welcoming of football players, though typically ones who have already accomplished enough in the NFL. The invocation of “courage” to separate him from other players reeks of hubris and self-righteousness. That may have not been Sam’s intention, but it speaks to an overall problem many—gay and straight—have with him. Representation remains an issue for minorities collectively, but one thing we should all remember is that none of us living on the outliers of what constitutes the mainstream—heterosexual, cisgender, white as the sheets of a bigot—owe anyone a damn thing. Sometimes, being exactly who you are day to day is a revolutionary act within itself. It is ideal for many of us to speak out and be seen, but it is not a requirement. And though Sam may consider himself “courageous” for coming out before being signed to a team, others might say it probably wasn’t a great idea to posit yourself as the first openly gay player in the NFL without actually being signed to a team first. For any NFL player who comes out publicly, he will likely be burdened with constant questions about sexuality. Then be blamed for speaking about it while simultaneously being exploited by media for ratings and clicks. Michael Sam seems to have a better understanding of this than he lets on. However, his fate is determined by how he plays, not by how he handles publicity. Maybe Michael Sam will get there, but right now it appears that the consensus is that he has not proved himself to be good enough to make room for all his baggage. It may not appear fair, but there is a difference between living your truth and chasing stature. It’s OK to want to be a big deal, but it takes more than positioning to make it so.